1 2012/10/13 Japanese ani.. Puella Magi Madoka Magica ..
3 2010/05/22 Japanese ani.. Introduction of best top 5..
4 2010/03/19 Japanese ani.. Japanese anime list of Spr..
6 2009/09/21 Japanese ani.. Anime version of Crayon Sh..
7 2009/09/15 Japanese ani.. The list of Japanese anime..
8 2009/06/27 Japanese ani.. "EVANGELION:2.0 YOU C..
9 2009/06/23 Japanese ani.. "Saint Seiya: The Los..
10 2009/06/18 Japanese ani.. The movie of "EVANGEL..
2012/10/13 "Japanese anime > Puella Magi Madoka Magica Movie Chapter 2 started today"
2010/09/22 "Japanese anime > Anime in this autumn"
We finished inputting the data of animes which start in this autumn. 2010/05/22 "Japanese anime > Introduction of best top 50 anime by movie"
A use of JP works db in JP version created the movie which introduces the best top 50 anime from 2008 to 2010 using the ranking of this db. 2010/03/19 No.2 "Japanese anime > Japanese anime list of Spring in 2010"
You can now see Japanese anime list which starts in this spring. I hope you will find interesting anime for you. 2010/01/06 "Japanese anime > Anime list in this season"
You can find Japanese anime list in this season in the following url. 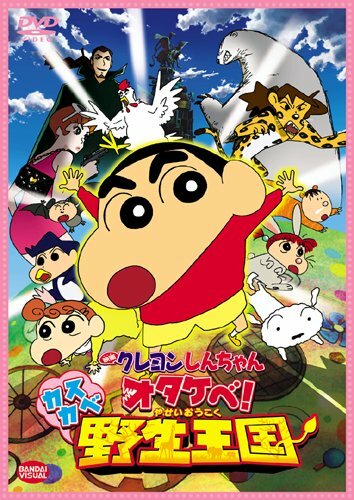 2009/09/21 No.2 "Japanese anime > Anime version of Crayon Shin-chan will continue in spite of the death of the author"
Anime version of Crayon Shin-chan will continue in spite of the death of the author "Yasuto Usui". TV Asahi staff said so. In the case of anime episodes, about 1 of 5 episodes has been created using the episodes of comics. So other anime episodes have been created by others. So if the families of the author Yoshito Usui allow, the anime episodes of Shinchan can keep created. 2009/09/15 "Japanese anime > The list of Japanese anime which will start in autumn of 2009"
I almost completed the list of Japanese anime which will start in autumn of 2009 except for a few animes whose starting date information hasn't been provided yet. You can see the anime list at the following url. 2009/06/27 No.2 "Japanese anime > "EVANGELION:2.0 YOU CAN (NOT) ADVANCE" is on air in Japan from today"
"EVANGELION:2.0 YOU CAN (NOT) ADVANCE" is on air in Japan from today. So far, it seems that it is getteing good reputation. Newspaper reported many people have gone to the movie theater for Evangelion 2.0. 2009/06/23 "Japanese anime > "Saint Seiya: The Lost Canvas - Hades Mythology -" will be released tommorow"
"Saint Seiya: The Lost Canvas - Hades Mythology -" will be released tommorow. I think the ending song of it is great. I haven't had the interest in this works until I saw this movie, but I will read the comics and the anime due to watching this ending song. 2009/06/18 "Japanese anime > The movie of "EVANGELION: 1.0 YOU ARE (NOT) ALONE" wil be shown from 3rd of July at the theaters of USA"
The movie of "EVANGELION: 1.0 YOU ARE (NOT) ALONE" will be shown at the theater of USA. 100 theaters in USA will show it from 3rd of July. New Evangelion's movie will be shown in Japan at the end of this month, so probably this is for showing the new movie, too in USA in near future, I think.